Tommy Hilfiger Ladies Jumper. Condition is New with tags. Dispatched with Royal Mail 1st Class. Grey Italian wool, size large, unwanted purchase, lovely jumper. You are looking at a Ladies Tommy Hilfiger, 100% Cotton, Turtle / Roll / Fold Neck Jumper / Sweater. I haven't seen many of these available for sale! Really nice and warm. Perfect for the cold weather. SHOULDER TO HEM - 26". PIT TO PIT - 18". SHOULDER TO HEM - 19". SHOULDER TO HEM - 26". Made from 67% Lambswool, 20% Angora (Rabbit Hair) and 13% Nylon, it feels great on! 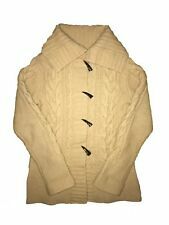 You are looking at a Ladies Tommy Hilfiger, Chunky Cable knit Cardigan / Jumper / Sweater. Colour: Beige. Type: V-Neck Jumper Sweater. Colour: Pink. Material: Cotton. Chest approx 22.5". Length approx 27". Tommy Hilfiger Sweatshirt. Embellished with beaded stars on shoulder. Chest approx 40". Shoulder to hem 25". I’m usually a size 8 for reference and 5’4. Tommy Hilfiger grey jumper. Open thick knit, crochet type effect. Size large Uk 12. SHOULDER TO HEM - 23". PIT TO PIT - 17". Type: V-Neck Jumper Sweater. Colour: Beige. Label Size: Size 16 Large. Material: Cotton. SHOULDER TO HEM - 24". Women’s’Tommy Hilfiger Golf’ Sweater, Black ,Logo On The Sleeve.100% Cotton. Versatile Sweater, can be Worn all year round. Looks good over a shirt. Or dress up with Silk scarf,VGC. Purchased direct from Tommy Hilfiger so Can Confirm authenticity. Type: V-Neck Jumper Sweater. Colour: Purple. Label Size: Size 10 Small. Condition: Good Used Condition - the item shows minor signs of previous wear. SHOULDER TO HEM - 22". Good Used Condition, the item shows minor signs of previous wear. LENGTH BACK - 25". LENGTH FRONT - 23.5". PIT TO PIT - 17". SHOULDER TO HEM - 24". Rib knit tie. Contrast locker patch. Deep V neck. Ribbed cuff, hem and neck banding. In good used condition except signs of wear, slight fabric pilling, minor stain on the front hem banding and inside cuff banding (see the picture gallery). Very stylish Tommy Hilfiger west in size S (size 4). It' has an army green, khaki colour, a bit more green than on the first picture, not faded. Fastens with buttons and a strap. It has a grey cotton inner lining. SHOULDER TO HEM - 26". PIT TO PIT - 19". Tommy Hilfiger black fleece v-neck jumper with small embroidered logo. Size XS (fits UK 6-8) Elastic drawstring on waist. LONGLINE BELTED WRAP CARDIGAN. Colour:Beige with diamond pattern detail. 1/2 Length Kimono style sleeves. Material: 100% Cotton. Pit to pit 22" length 29"cost 110. SHOULDER TO HEM - 23". Color: peach pink (Due to the quality differences between different monitors, the picture may not reflect the actual color of the item ). Fit: Regular. Item may have minor signs of wear (if is noticeable small defects they will be pictured above & detailed), but generally looks nice. SHOULDER TO HEM - 23.5". Type: Hooded Jumper Sweater. Material: Cotton. Label Size: Size 14 Large. Double knit cuff and hem banding. Round neck. 100% cotton jersey. Ribbed neck banding. Striped back neck banding. Left chest intarsia badge. 3-button left shoulder placket. Machine washable. Type: Cardigan Sweater. Colour: Multi. Material: Cotton. PIT TO PIT - 18". Hi, I am Patrisska your personal picker of top pre-loved clothing. Up for sale is this beautiful jumper TOMMY HILFIGER in multicolour. Features: 100% Cotton, Striped pattern. ↔ Chest: 18". In very good condition, except small stain. PIT TO PIT - 19". Navy blue cardigan, with a fold over collar. Long sleeves and wooden style buttons to front and sleeves. UK size 12 Large. In good used condition except a bit bubbly material. Long-sleeved, Crew-neck, with ribbed cuffs and hems, Pima-Cotton-knit, White and Blue Spotted Patterned Top.